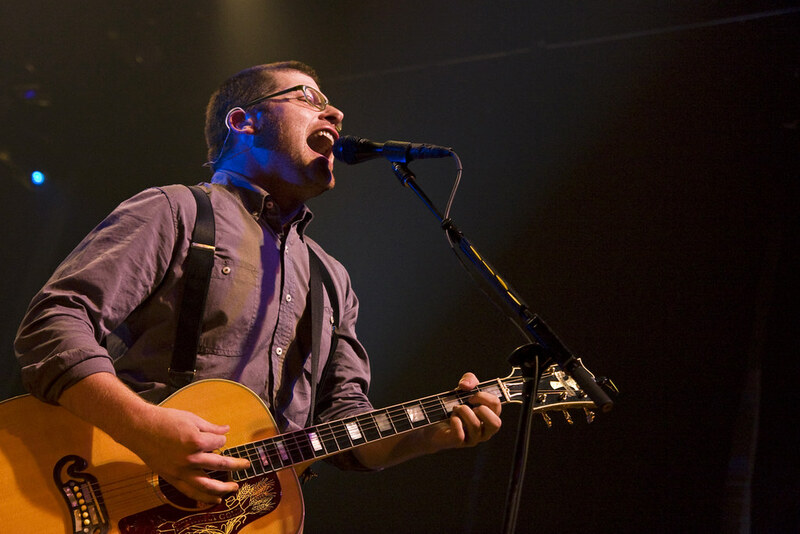 The Decemberists “lottery” show at Terminal 5 was nearly three weeks ago. Since its taken us quite a while to turn around this recording (more below), rather than review the show we suggest our readers read the following excellent coverage of this unique show from various sources: rockscope, Will You Miss Me When You’re Gone, and brooklynvegan. The story of this recording involves a lot of frustration and a ton of work which has ultimately led to something we’re proud to offer our readers. Acidjack captured a fine recording of excellent clarity and depth which was marred by one major problem — an apparent ADHD case who spent much of the show rattling and drumming on the railing that held the microphones. The result on the raw wav file was a persistent unlistenable series of tapping noises. I spent hours trying to fix it, but ultimately gave up. Acidjack however, was not to be denied. He took the job and persisted — ultimately producing a recording that is not only quite excellent, but very listenable through even the “drumming” segments. To compare the raw files to the finished product is almost unbelieveable. Enjoy! If you email nyctaper for access to this recording, we expect that you will PLEASE SUPPORT The Decemberists, visit their website, and purchase their official releases from the Decemberists Shop at their website [here]. Post-rock pioneers Tortoise are back with a vengeance. Their June 2009 release Beacons of Ancestorship is easily their most powerful album since 2001’s Standard. The recent reports from the 2009 shows have been glowing, and on Tuesday night at Le Poisson Rouge, those reports were confirmed and more. Tortoise performed a stunning seventeen songs, including an unheard-of two encore segments of five total songs. The set consisted primarily of Beacons material with a nice selection of older material towards the end of the set. We seriously acknowledge the continued excellence of Le Poisson Rouge as a venue. Their diverse and eclectic artist bookings continue to impress, and their sound system has continued to improve in quality. Additionally, the venue has been incredibly nice and cooperative to the nyctaper site in many ways, including permitting Acidjack to enter the venue early for this show to set up. The result is perhaps his finest recorded contribution to this site, a recording of outstanding balance and clarity with a remarkable bass response. Thanks again to all involved in the production of this superb listen. Enjoy! Recorded from the front of the soundboard, mics mounted 11′ up on either side of center post. If you email nyctaper for access to this recording, we expect that you will PLEASE SUPPORT Tortoise, visit their website, and purchase their official releases from the discography page at their site or directly from Thrill Jockey Records.